'The Revenant' swept the winners board at The 73rd Golden Globes. 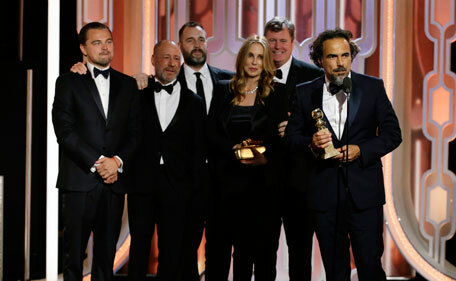 Leonardo DiCaprio, who starred in the historical drama, took home Best Actor while Alejandro González Iñárritu was awarded the gong for Best Director. And 'The Revenant' took the biggest award of the night as it was named the Best Picture Drama, beating out Carol, Mad Max: Fury Road, Room, and highly touted Spotlight. Epic survival thriller 'The Revenant' won the Golden Globe for best motion picture drama Sunday, the third major prize for the film on the night - boosting its profile ahead of next month's Oscars. Best Actor in a Motion Picture - Drama - Leonardo DiCaprio - 'The Revenant'. Leonardo DiCaprio gets a standing ovation as he wins Best Actor award. Best Actress Drama went to Brie Larson for Room. 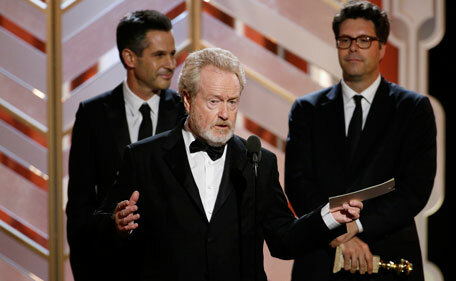 Director Ridley Scott's movie was up against 'The Big Short', 'Joy', 'Spy' and 'Trainwreck'. Scott's 'The Martian' is about an astronaut forced to use science and his wits to survive for years after being left alone on Mars. Jennifer Lawrence took home her fourth Golden Globe on Sunday night. The 25-year-old gushed about her Joy director, who helmed three of her films to garner awards gold. David O. Russell. This is Inarritu's second Globe two years in a row - last year he won Best Screenplay for 'Birdman'. Tom Hanks presented Denzel Washington the Cecil B. DeMille Award. Lady Gaga was moved to tears after winning for 'American Horror Story: Hotel'. The pop star picked up a gong for Best Actress in a Supporting Role in a Series, Limited Series or Motion Picture made for Television. Taking to the stage, she said: "This is one of the greatest moments in my life. I just have to thank Ryan Murphy, Thank you to my wonderful cast. You are my family. I could name the entire cast and because of you I was able to shine." Gaga then admitted: "I wanted to be an actress before I wanted to be a singer. But music worked first I guess." 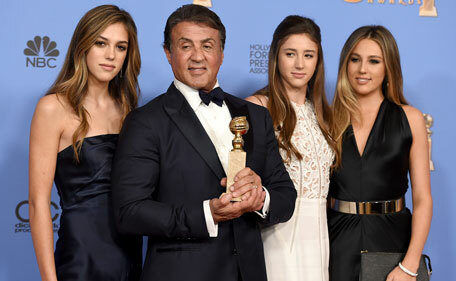 Sylvester Stallone took home the gong for Best Supporting Actor at the Golden Globes. The 69-year-old received a standing ovation as he won for 'Creed' almost 40 years after winning Best Screenplay at the annual ceremony for 'Rocky' in 1977. 'I want to thank my imaginary friend Rocky Balboa for being the best friend I ever had,' he ended on a lighthearted note. Kate Winslet led the early winners at the Golden Globes on Sunday as an unapologetic Ricky Gervais kicked off the glitzy ceremony by taking shots at some of Hollywood's biggest names. Winslet was visible shocked as she won best supporting actress for her role as Joanna Hoffman in biopic 'Steve Jobs,' saying she was "extremely surprised and overwhelmed." Kate beat out some stiff competition in her stacked category, including, Jane Fonda (Youth), Jennifer Jason Leigh (The Hateful Eight), Helen Mirren (Trumbo), Alicia Vinkander (Ex-Machina). 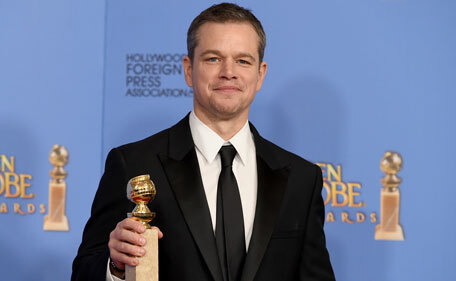 Matt Damon thanked his children who were watching as he took home the gong for Best Actor in a Musical or Comedy film at the Golden Globes. The 45-year-old was honoured for his starring role in 'The Martian'. Damon was clearly in a nostalgic mood as the actor noted that he was onstage at the annual awards ceremony held at the Beverly Hilton in Los Angeles 18 years before for his film 'Good Will Hunting'. 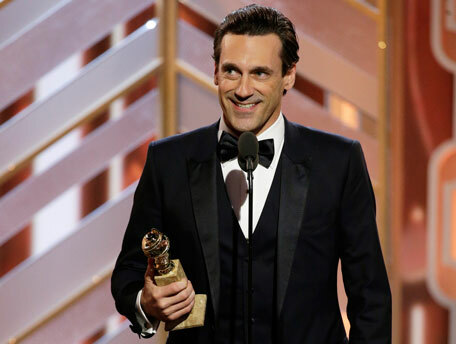 Jon Hamm ended his tenure on Mad Men, which aired its final season last year, on a high note. The 44-year-old took Best Actor In A TV Drama at the Golden Globes for the second time for his work on Mad Men, which has seen him nominated at the ceremony six times over the years. 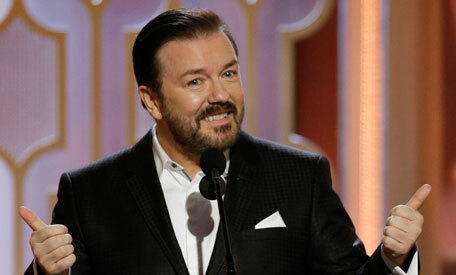 Gervais, returning to host for the fourth time, riled up the audience with his opening monologue, calling the audience "disgusting, pill-popping, sexual deviant scum." He directed his acerbic tongue towards Sean Penn, Jeffrey Tambor, Matt Damon, Jennifer Lawrence and Caitlyn Jenner. He praised Jenner for being a role model before quickly quipping "She didn't do a lot for women drivers. But you can't have everything, can you?" referring to Jenner's Malibu car crash last year. He took a swipe at Lawrence's essay on why women aren't being equally paid as men in Hollywood, saying "How the hell can a 25-year-old live on $52 million?" Gervais also joked that he was earning what Tina Fey and Amy Poehler combined earned when they hosted the Globes last year. "It's not my fault if they want to share the money," he said. Amazon's musical show 'Mozart in the Jungle' was the surprise winner of best TV comedy series and 'My Crazy Ex-Girlfriend' newcomer Rachel Bloom took home the award for best comedy TV actress over favorite Julia Louis-Dreyfus. Some see the Golden Globes, voted on by the 90 or so members of the Hollywood Foreign Press Association, as predictors of the more prestigious Academy Awards. Oscar nominations will be announced Thursday, with the show following on February 28.